Would you make a good diagnostic medical sonographer? Take our career test to find out how you match with this and over 800 other careers. What is the workplace of a Diagnostic Medical Sonographer like? Diagnostic ultrasound uses high-frequency sound waves to produce images of the inside of the body. 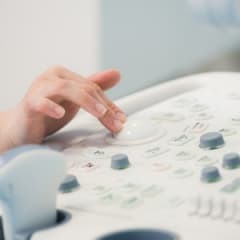 The diagnostic medical sonographer presses an instrument called an ultrasound transducer to the parts of the patient’s body that are being examined. The transducer emits pulses of sound that bounce back, causing echoes. The echoes are then sent to the ultrasound machine, which processes them and displays them as images. Breast sonographers specialize in imaging a patient’s breast tissues. Sonography aids mammography in the detection of breast cancer. Breast sonography is also used to track tumours in breast cancer patients. Obstetric and gynecologic sonographers specialize in imaging the female reproductive system. Many pregnant women receive ultrasounds to track the baby's growth and health. Cardiovascular and vascular technologists use sonography to assist physicians in diagnosing problems with a patient’s heart, arteries and veins. Are you suited to be a diagnostic medical sonographer? Diagnostic medical sonographers have distinct personalities. They tend to be investigative individuals, which means they’re intellectual, introspective, and inquisitive. They are curious, methodical, rational, analytical, and logical. Some of them are also social, meaning they’re kind, generous, cooperative, patient, caring, helpful, empathetic, tactful, and friendly. Does this sound like you? Take our free career test to find out if becoming a diagnostic medical sonographer is right for you. Most diagnostic medical sonographers work in hospitals. Some work in physicians’ offices or imaging clinics. 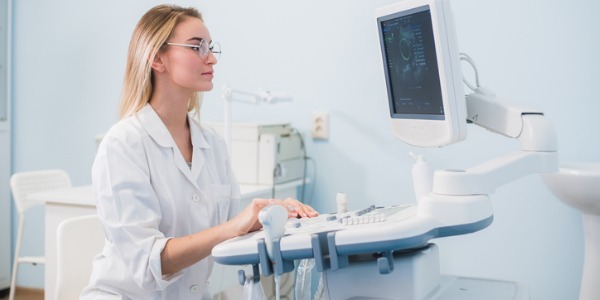 Diagnostic medical sonographers do most of their work at diagnostic imaging machines in dimly lit rooms, but they may also perform procedures at patients' bedsides. Sonographers may be on their feet for long periods and may need to lift or turn patients who are disabled.